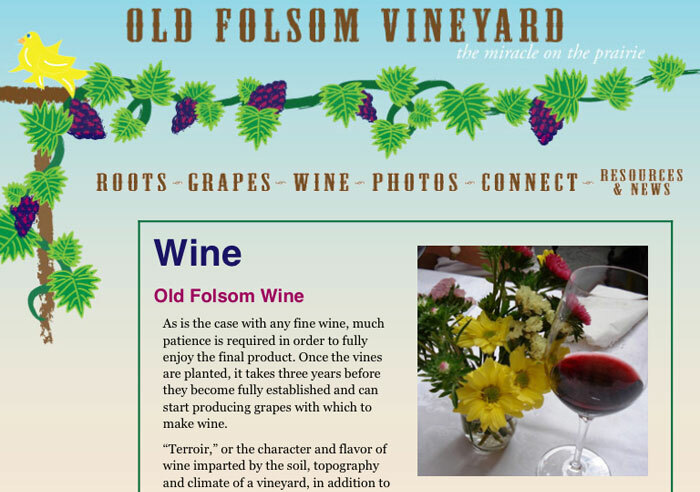 In 2010, the year of Old Folsom Vineyard’s first harvest, Kelsye designed and hand-coded our very first website (pictured above). We’ve come a long ways in those past six years–and so has the world wide web–so we are excited to share with you the latest rendition of our site. With profiles of the wine made from OFV grapes, to stories from the prairie and upcoming events, we hope that our new site does a better job of providing the kind of information you find useful and interesting. Should you have any suggestions or encounter any problems with our site, please email us at oldfolsomvineyard@gmail.com. We appreciate your feedback! Special thanks to Firehouse Wine Cellars for allowing us to use some of their gorgeous photos–including the one of the monarch butterfly–on our homepage.